FREE crosswords are fun online games for kids and adults! Puzzles are divided into categories. Choose the category you like and begin playing. Check your crossword answers or make corrections with the crossword helper keys. One key is located beside each puzzle. The other key holds the crossword answers to ALL puzzles on this website. Play the puzzles, first, before using the keys. No peeking ahead of time! 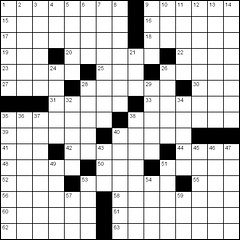 CROSSWORD HELPER: There are two crossword helper keys. The helper keys hold the crossword answers to puzzles. One key is located beside each puzzle. The other key holds crossword answers to ALL of the puzzles on this website. Use the crossword helper keys to check your answers or make corrections. No peeking too soon! EASY CROSSWORDS: Fairly easy for adults to solve. DAILY CROSSWORD PUZZLE: Find a day of the week, Monday - Saturday, hidden inside these puzzles. MATH CROSSWORD PUZZLES: Find addition, subtraction, multiplication and division puzzles. There may be a combination of math functions to figure. These puzzles have short statements or descriptions. Figure the equations to find the answers. To benefit the most from math crossword puzzles, solve them by hand on paper first, without using a calculator. Use your thinking skills! Use your calculator, if needed. PRINTABLE CROSSWORD PUZZLES: All of the crossword puzzles at this website are printable. This category has a jumbled variety of topics. SUNDAY CROSSWORD: The word "Sunday" is hidden inside these puzzles. All printable crossword puzzles are designed and created, specifically, for this website. They can't be found anywhere, except for right here. They're unique and made for all ages! Crosswords help keep the mind active and alert, stimulate thinking and memory skills, expand vocabulary, math skills and more! They're a fun, FREE and healthful activity for kids and adults! So, if you're ready for a challenge, play FREE crosswords now! They're fun online games!